This photo was taken on December 27, 2018 at 8:38 AM. The location was in the street near the entrance to a very nice upscale Hotel in NW Washington DC. The "Take It!" Came immediately as I have renewed interest in how paper can take on random forms when found in the street that has been in contact with rain and compressed by being run over by vehicles and or being stepped on. 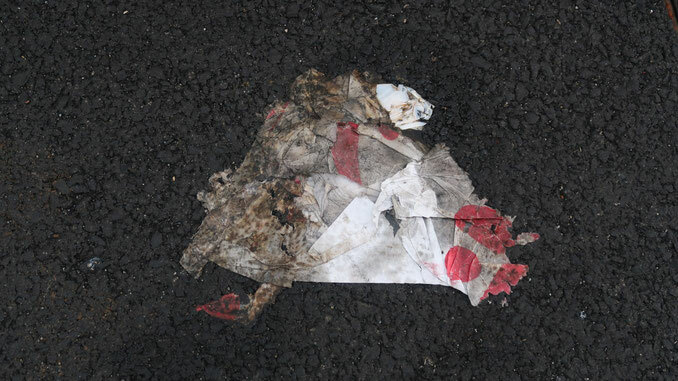 This one caught my eye as it looked to be a bit of discarded Christmas wrapping paper that had received the "treatment" and by the miracle of randomness the head of a cat was formed and is peering out from the upper right of the blob of paper. The After Take: I have found that it is important to explain in advance of showing the picture in my camera to person. The explanation must be done using language that somehow makes imagination seem rational. This sometimes can include the luxury of touching upon what might be an immediate question by a new viewer in order to have that part of the mind that might be distracted - by the question - already answered and thus ready to better focus on a central theme or object in the photo. I enjoy asking people if they have experience with shape identification using clouds. If they have this experience - I tell them this is a very similar program - only it is taken to the street and many times calls for the black of asphalt to be the canvas - rather than the blue of sky when cloud watching. All seem to enjoy listening and absorbing this comparison. I have been sharing photos like this for a number of years to a fairly set audience. The showing is always prefaced with a request if they would like to see something I was able to photograph. I cannot recall being refused. The quick showings as mentioned above - are done while people are usually doing something else - and decided to take a moment for a break. Should they be very tied into what they are doing - and have to keep with what that might be - most will ask that I bring it back another day - and I do. Thank you for joining me in the hunt for street subjects. Their emergence is uplifting in every sense of the word. I've spent my entire life thinking it was spelled paper mache... Learn something new every day. Lol Street Papier Mache is a very sophisticated way of saying trash. We could fool a bunch of uptight millennials into becoming sanitary workers by making the job title Street Papier Mache Collector. Ha! The white piece at the top of it looks like a cougar or panther head. My daughter said "Why did he take a picture of trash?" She doesn't get it. My wife now has our daughters arts and crafts lesson set up for next week. She's going to learn what papier mache is and how to do it. The upscale hotel probably doesn't like trash thrown about in front of their building. However if you sell them the idea on calling it 'street Papier-mâché,' maybe they can turn it into an exhibit for guests.